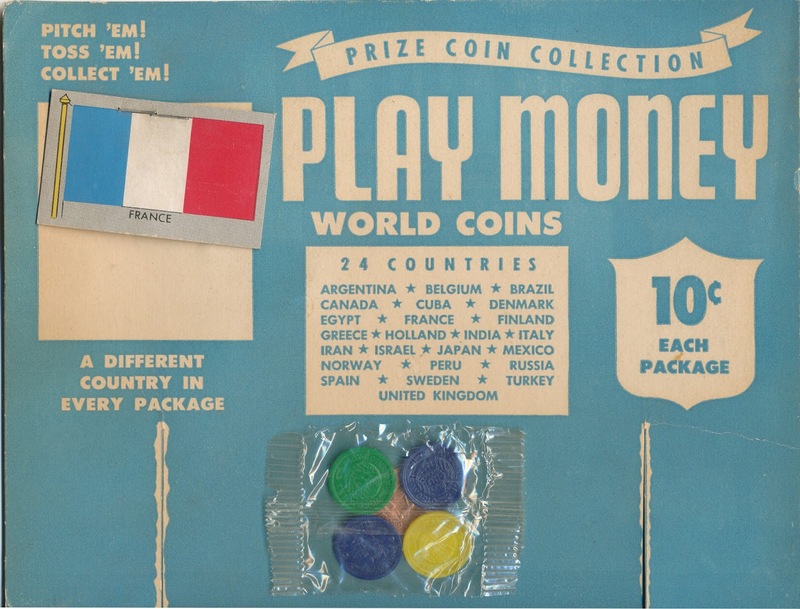 You may recognize this bad boy from a prior post on the 1949 Play Coins Of The World Set. 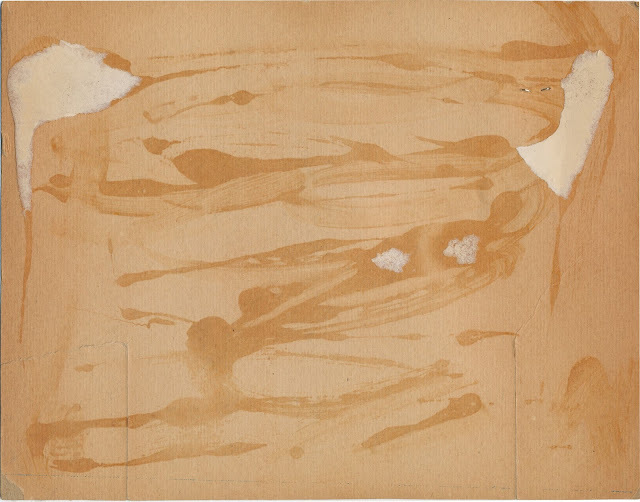 I snatched this piece up immediately (although I am happy to report I negotiated the price downward first) and left it until I got home and could safely examine it. The cello bag with the coins had ripped at some point so there is no way of knowing how many coins were originally within but I suspect more then five since the ten cent pack was a reissue if the coins inserted in penny tabs in 1949 (the piece above is from 1950 based upon the Flags of the World card attached to it). I believe the cello bag was originally stapled to the card in the upper left as there is an extra staple in it that does not attach it to the header card. The two slots at the bottom make me think this came with a generic box that held the coins (and possible some Flags cards but I am not sure about that at all). It's a neat item. If you have been reading along at home, you will note this is my 500th post-thanks for all of the attention and comments! Much more to come as we march toward 1,000! Well gang, two of my better hauls in recent memory occurred at this year's National in Chicago. I was a bit on the fence about which to discuss first but have elected to go with the sports theme to start. 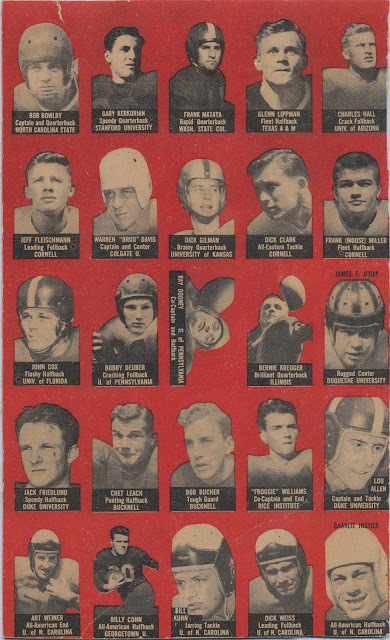 The 1949 Topps Varsity Football issue, aka Felt Back Football in the hobby parlance, has been covered here previously and collectors of the set along with my faithful readers know that it consists of 100 cards, divided into four groups of 25, each of which has a bright background color (green, red, blue and then brown replicates what is also found on yellow, or vice-versa). This is a tough little set, especially in nice condition. 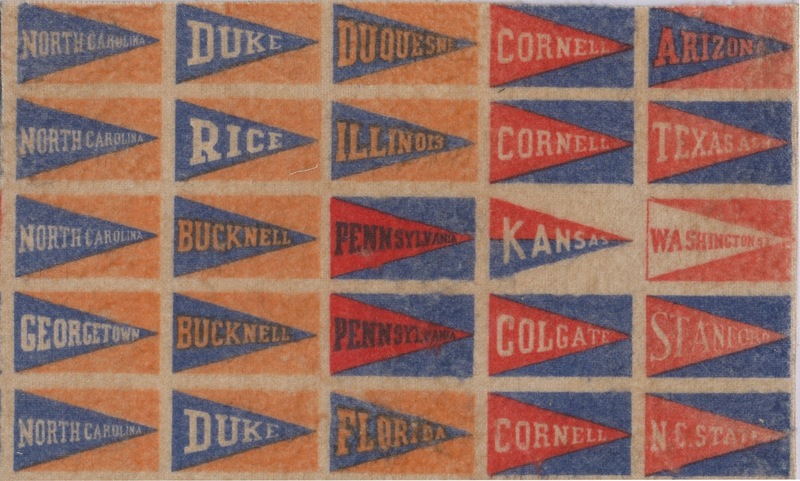 I have an operating theory that, except for the 1948-49 Magic Photos (and the small 1955 Hocus Focus cards), all of the small, postage stamp sized cards Topps issued snugged between the wrappers of their penny gum tabs in 1949 were printed on sheets, or possibly half-sheets, of 100. I feel that Magic Photo and small Hocus Focus sets were printed in sheets of 126, which is supported by both a known uncut sheet of Magic Photos and the size of said series (two of 'em, each 126 cards in length, not to mention the 126 card size of the Hocus Focus set). But I digress. I bough the sheet from Touchdown Treasures and they had a green and brown sheet as well. Yellow had been seen previously I was told but nary a blue has surfaced. I was tempted to buy the other two sheets as well but decided one was enough. Well kids, I am back from The National in Chicago and while I have a couple of blog-worthy items obtained at said show, I'll be posting about them shortly. Today I want to take a look at a 1972 issue called Gum Berries. Usually identified as a 1971 issue as they replicate that year's artwork from Rocks O' Gum, previously covered here, we'll see momentarily Gum Berries came out in 1972. 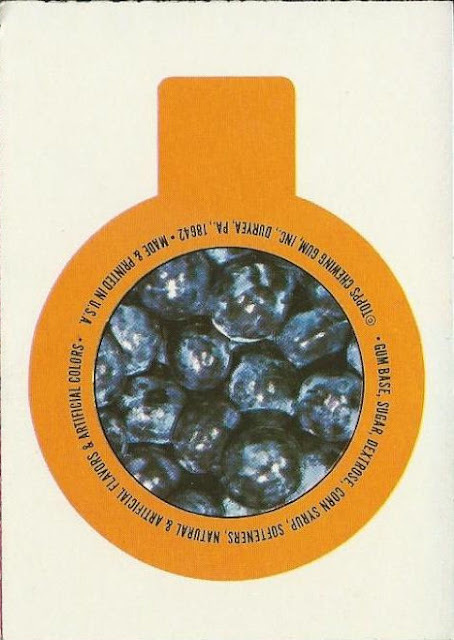 There is a 1974 Topps product catalog that shows a raspberry version of Gum Berries so I think it's possible the 72 version was a test of sorts and reused the Rocks O' Gum artwork as it was handy and of the proper configuration. Topps tested all sorts of products and materials, not just trading cards, and it appears it took them a few years to be happy with their "rocks". Gum Berries are harder to find than Rocks O'Gum, which are among the most common of Topps issues. I suspect there was a massive find of the latter at some point as you could buy sets in groups of 9, all in plastic sheets (55 sheets with nine examples of the same card in each) at one point on eBay for a song. 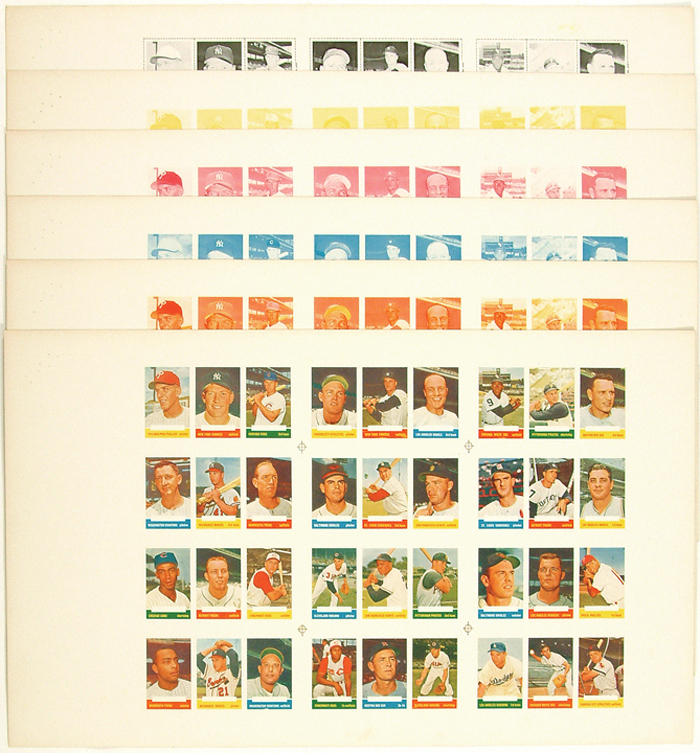 I have only posted about the 1971 Topps Greatest Moments set once here and it was part of a catchall thread at that. Recently two proof sheets popped up on eBay and while they are not unknown, scans of the reverses are now viewable so I figured they would be a worth a look. The set is tough but not impossible, 55 large cards (they measure 2 1/2" x 4 3/4") with black borders and both a color headshot and a black and white photo of the "greatest" moment in the career of the player depicted make fora snazzy looking pasteboard. 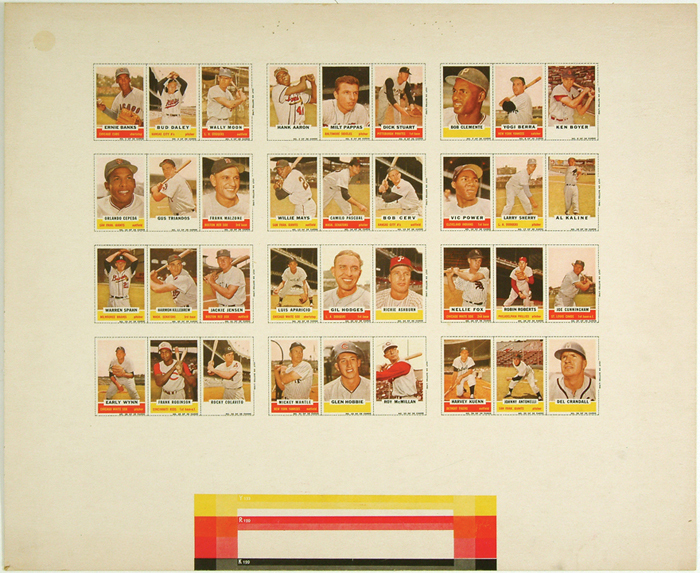 There are 33 short prints and 22 double prints, which gives a sheet off 77 cards.The October 15, 1971 issue of The Trader Speaks relates that the cards were tested in Brooklyn in July of that year. While a display box flat is known (and is shown in my previous post, no wrapper has been found. The test probably fizzled, perhaps due to the prominent use of black and white photos at a time when the print world was awash in color. I am still digging into how the majority of the cards entered the hobby since they are more abundant than a normal test issue but likely it was some combination of the Card Collectors Company and a few Topps insiders. I don't think they would have been Fun Pack fodder due to their odd size. They are hard to find but not necessarily scarce and sets can be assembled with reasonable dispatch, although if you want NM cards you may be searching for a while. I think it's a great looking set. One very neglected area of the collecting world is the Bazooka issues from 1959-71 (some older sets exist but were in a different style). 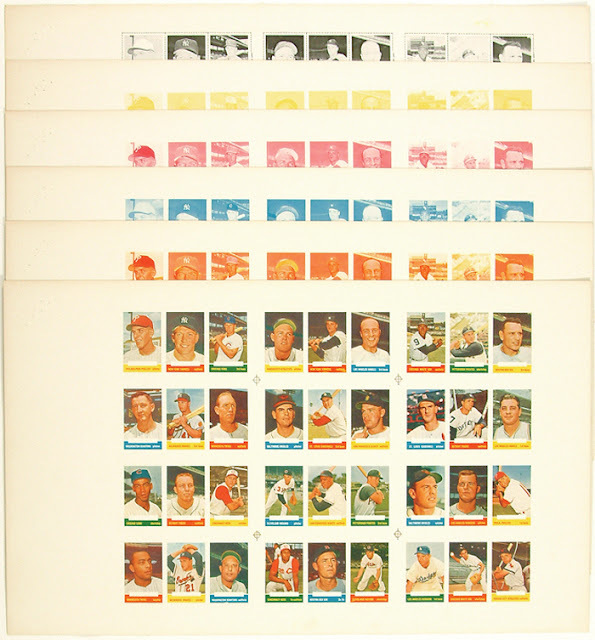 Mostly known for small sets of package design cards featuring baseball players, as well as occasional football, hockey and non-sports subjects, numerous Bazooka sets were issued by Topps in their heyday. The 1959 inaugural baseball and football sets were behemoths and Topps subsequently trimmed the size down in 1960 (two sizes exist from 1960-67, due to differences in the 20 cent and 25 cent Bazooka box dimensions) and began an eight year run of the familiar 3 card panels. Tough to find today in neatly cut form, some collect the three card panels or even complete boxes. Production runs compared to regular Topps baseball issues were miniscule and given how many were probably just tossed or mangled back in the day, survival rates are likely much worse as well.